Bok Choy is classified as a cabbage, although it bears little resemblance to the round European cabbages found in western supermarkets. Cultivated in China 6000 years ago, bok choy is found in soups and stir-fries, appetizers and main dishes. It was introduced to Europe in the 1800's is now readily available in supermarkets throughout North America. It is available in both Green and Red varieties. Bok choy's popularity comes from its light, sweet flavor, crisp texture and nutritional value. 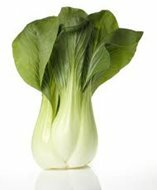 It is high in Vitamins A, C, K and calcium; 54% of Bok Choy's calcium can be absorbed which is much higher than even milk which comes in at 32%.